Full of arts and crafts, games and activities. There’s lots and lots inside to keep every Hello Kitty fan entertained! 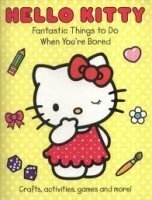 This book is packed full of Hello Kitty's favourite things to do when she's bored. With art and craft ideas, games to play with friends, activities to try, and fun food and drink ideas, you'll always have something to do, whatever the weather!